I know diddly squat about scrapbooking but I like being creative and I love the idea of making mementos - even though I don't have children to pass anything on to. I thought scrapbooking was a glorified photo album but I now realize they are so much more. They are not only for photographs, but for anything that you feel like putting onto the pages. 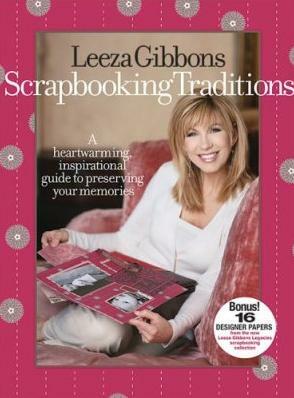 Leeza Gibbons' scrapbooks are reminders of her memories and she has great ideas for using many different kinds of paper and ribbons, all of which you can make your own. I love the idea of using many different kinds of paper and the zillions of patterns you can personalize. Whether you track the growth stages of your children, your travels, your garden, your hair styles, your clothes, your friends, your culinary delights, your pets, cars, or whatever else, the love you put into the scrapbook memories will last forever. Using your computer and printer will cover for you if your handwriting isn't what you'd like it to be. Perhaps I may, after all, make a scrapbook of my own, for whoever may be interested after I'm gone. Leeza's given us 16 samples of her paper collection she and Xyron put out. Visit her at her websites: www.leezagibbons.com and www.leezasplace.org. Conclusion - Inspiring and interesting.